September 11, 2001: World Trade Center towers & Pentagon burn while President George W. Bush reads My Pet Goat to Texas schoolchildren; President later seen flying in circles over Midwest. Appears at Ground Zero 3 days later. August 30, 2005: Louisiana & Mississippi drown while President Bush plays guitar with country singer Mark Willis in San Diego, California. President appears on Gulf Coast 3 days later. 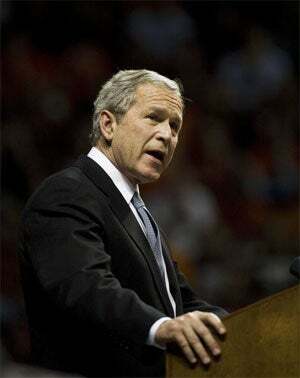 April 16, 2007: 33 murdered at Virginia Tech University; President Bush makes statement 3 hours after story breaks. President appears at school 1 day later for memorial convocation.